Researchers at the Germany-based Leibniz Institute of Polymer Research have developed a structurally colored coating based on graphene flakes, that changes color depending on deformation of the colored surface. Inspired by natural iridescence in fish skin, this coating could provide a simple way to warn of hidden damage in buildings, bridges and other structures. The team made the coating in an initial red, but when deformed, it appears yellow, and when cracked at the micrometer scale, green. This color-changing ability comes from a careful alignment of the graphene flakes in semi-transparent, parallel layers, coating a glass fibre. Under stress, the layers compress and flatten, changing the interference and color of reflected light. In fact, by overlapping graphene nanoplatelets (GNPs) with ordered and disordered features using a special deposition approach, unique “fish scale” like structures are achieved. 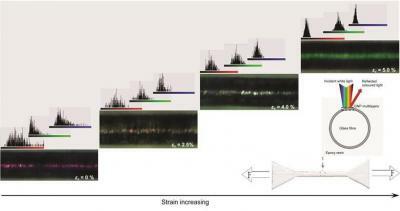 Variable structural coloration is observed through the mechanical tuning of fine parallel multilayers. Since structural failure often starts with tiny cracks and deformations which can hard to detect, this coating could give a clear visual warning of nascent damage before it accumulates and becomes a real danger. Real-world applications, however, will first require more knowledge about the properties and behavior of the coating, note the researchers.